I've been really excited about the idea of smoothies lately, so I decided I'd go ahead and make my idea a reality. 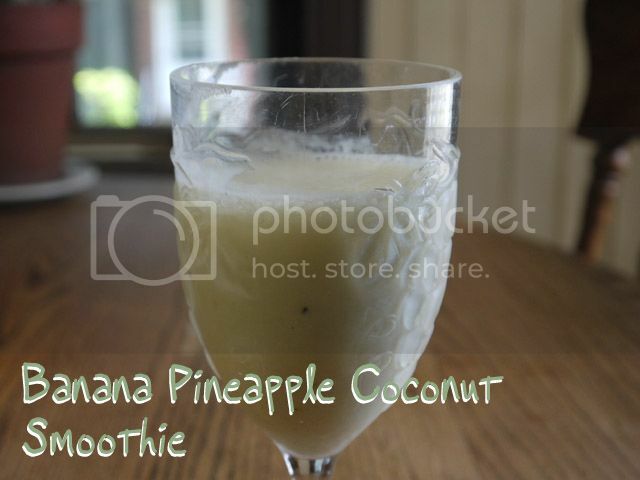 I adapted this smoothie recipe from several inspirations smoothies that I've found in recipe books and online. The ingredient list is pretty small, which is nice. Just six ingredient - plain yogurt (I used low fat), coconut water, pineapple, cinnamon sugar, bananas, and milk (I used 2%). If you are smart, you will just go out and buy a can of pineapple chunks. I decided to be adventurous and buy a whole pineapple. Now I have a ton of leftover pineapple and no idea what to do with it. If you do, in fact, buy a can of pineapple, you can obviously skip this next bit. 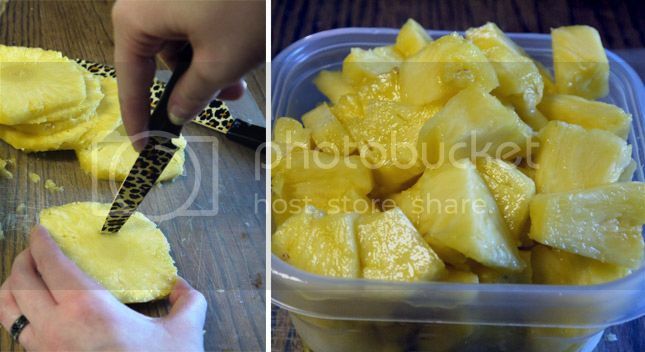 Cut the top off of your pineapple, then slice all the skin off. You probably won't get all of it on the first try, I had to go back over mine a few times to fine tune my trim job. 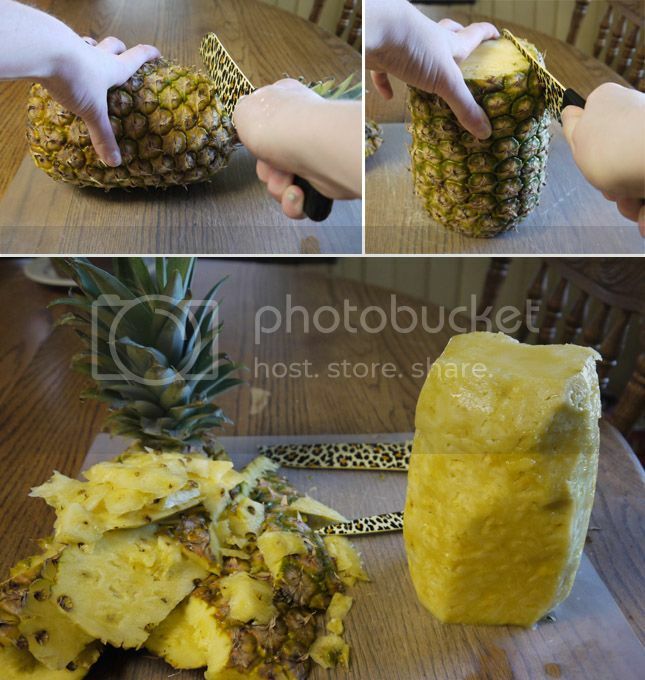 Eventually, though, you'll be left with a large cylinder of solid pineapple. You can choose to cut it up anyway you like, but remember to remove the core! I sliced mine into rings, cut the core out of each slice, then chopped it up into chunks. Probably not the most efficient way to do things, but my way rarely is. 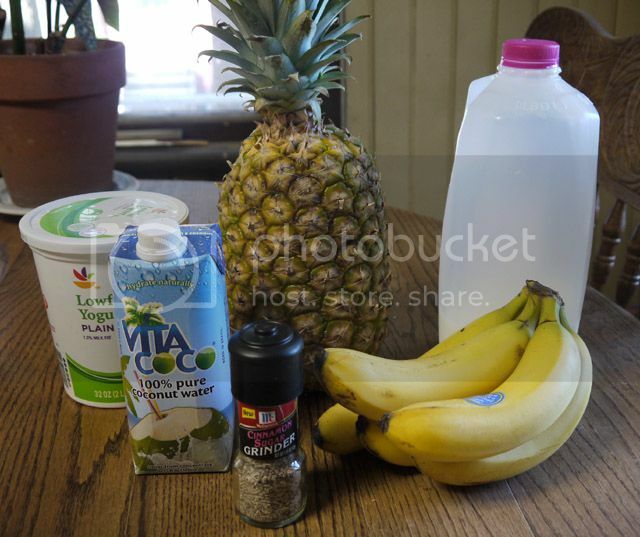 But yeah, you see that container of pineapple? That's about half of my leftovers. So much pineapple! And I'm the only one in the house who eats it. You'll need 1/2 a cup of pineapple for the smoothie, so put that much (or all of it, see if I care) in the freezer until it is frozen solid. A few hours should do the trick. Get ready to blend. I gave my pineapple chunks a quick chop by themselves, since I didn't want to overwhelm my poor blender all at once. That's probably not necessary. Next I added the milk, coconut water, cinnamon sugar, and yogurt and blended it again. 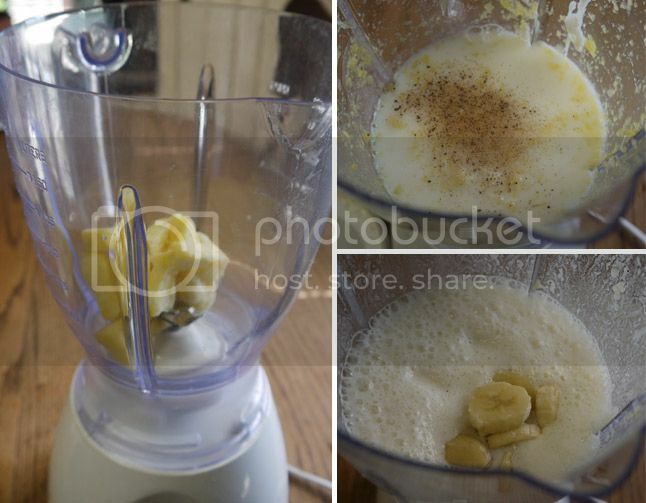 Finally, I dumped in the bananas and blended until smooth. And that's it. Pour it into a cup and enjoy. I broke mine into three 6.5 oz servings so that I can take them to work for breakfast, but you can go ahead and drink it all at once if you want. 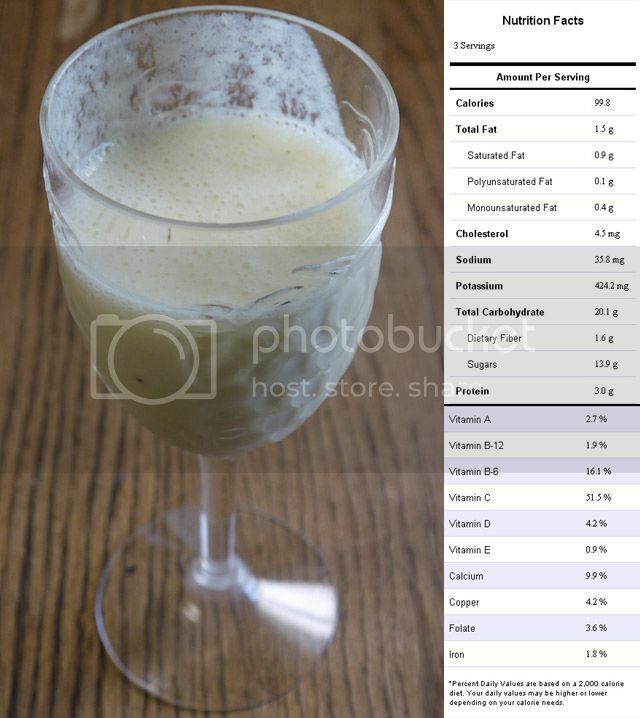 The nutritional information below is for 6.5 oz of smoothie.